The ‘momentum stage.’ That’s the term Kirk Smith uses to describe his current career status. It’s the point, he said, where one is ready to take past experience and education and make a big leap forward. He believes the YMCA of Greater Springfield is at that same point in its progression, creating an attractive match that prompted him to leave the YMCA of Central Florida and take on a new challenge in the City of Homes. Kirk Smith was talking about how he started down the career path that would eventually take him to the president’s office of the YMCA of Greater Springfield. And to tell the story effectively, he had to go back to his days working in operations and training at the River City Correctional Facility outside Cincinnati, where he grew up. There, at what he described as something between the county jail and prison, a facility designed to help reduce recidivism, he got an up-close and very personal look at what can, and often does, happen when people make the wrong choices. “The sad part about it is that many of those you see in jail are not bad people,” he explained. “Don’t get me wrong, there are a lot of very, very bad people in prison, and they definitely deserve to be there, but contrary to what you see on television, there are some good people who shouldn’t be there and wouldn’t be if some things had gone differently for them. And the sum of that sadness and disappointment became one of the key motivators for becoming involved in youth activities in the Cincinnati area after his day job ended, and eventually joining the YMCA family and beginning what became a career migration across Florida — from Tampa to Lakeland to Orlando — before coming 1,500 miles north to the City of Homes. He would eventually find a number of ways, ranging from a program, called the First Tee, which introduced children across all social strata to the game of golf and accompanying life lessons, to outreach work aimed at keeping children on the edge in school and on the path to a diploma. He’ll continue that work in prevention, among other things, in a position he called a perfect match between an individual and an organization in seemingly the same place in their progression. Elaborating, he explained that, from his perspective, professionals — and agencies — go through periods in their development. He said the first is what he called the ‘formation stage,’ when things essentially start coming together. This is followed by the ‘concentration’ period, when things begin to come into focus and the emphasis is on moving forward. The last of the four is called ‘stability,’ he told BusinessWest, when things begin to level off and, in simple terms, the cycle essentially starts all over again. Before stability comes ‘momentum,’ he continued. “That’s when you’re really starting to get things going, and you’re seeing the benefits of your education and your past experience. As a person, or organization, you’re gaining momentum. Only a few weeks into his new assignment, Smith is drafting a blueprint for familiarizing himself with the Greater Springfield Y, as well as this region and the challenges facing it, while also forging a plan for moving forward. To carry out these other tasks that are part of a broad assimilation process, Smith is creating what he calls “an engagement task force” (more on that later), to provide a broad snapshot of just where this Y is and a battle plan for getting it where it needs to go. There are many items on the to-do list, he said, but perhaps the most important — because it will make the task of achieving many goals that much easier — is improving the lines of communication and effectively getting the word out about what the Y is, who it serves, and how individuals can help with the mission. 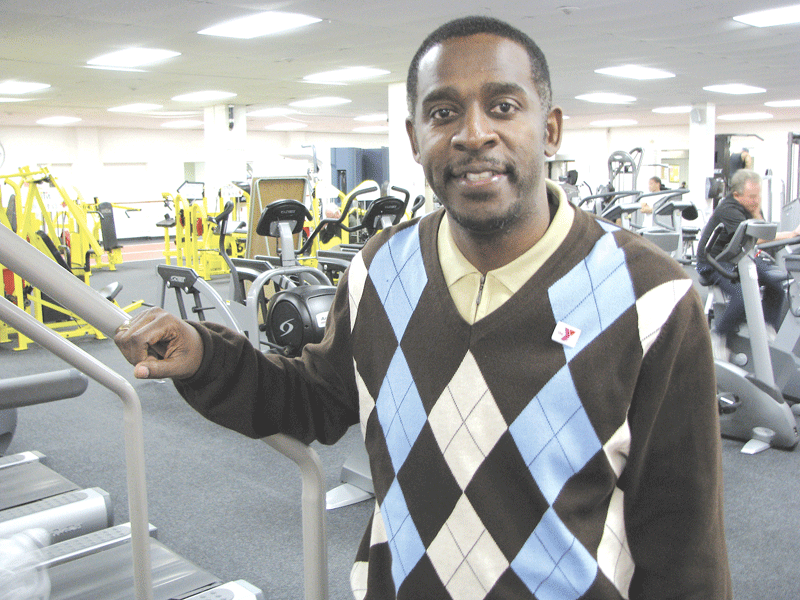 For this issue and its focus on health and wellness, BusinessWest talked at length with Smith, who believes his intriguing array of career stops, including that stint in corrections as well as a seven-year hitch in the U.S. Army, will serve him well in this big step forward in the momentum phase. Smith told BusinessWest that he made his Army recruiter’s job quick and easy. That’s because, starting around the time he reached middle school, Smith was consumed with thoughts about how to escape from the tough and troubled Cincinnati neighborhood known as Avondale, and the Army provided an effective out. Smith’s seven-year stint in the Army, spent in Korea, New York, and Virginia, was just one of several stops he credits with helping to mold him professionally and provide insight and perspective into societal challenges and the many types of constituencies that form a community — and their needs and challenges. His time working in corrections, with both juveniles and adults, was especially eye-opening, as he said, and, ultimately, career-altering. “That experience in corrections got me to the YMCA,” he explained, adding that he was working several hours a week in youth programs, and eventually decided he wanted — and needed — to do it full-time. “I was very gung-ho coming out of the military, as you can imagine,” he said. “I was young, and thought I was tough and ready to take on the world; I was thinking, ‘bring it on.’ But corrections broke me down. It started to soften me and helped me understand that there are people in need, and if we don’t help them we’re going to be in trouble. His first rung on the Y ladder was a stint as associate executive director of the facility in Tampa. There, he gained invaluable experience on the operations side of Y management, with everything from fund-raising activities to program administration, while also widening his portfolio of work with young people as a case manager providing different types of assistance. “If they were struggling in school, I’d help them stabilize their situation, and if they had dropped out, I’d help them get back into the school system so they could finish, get their diploma, and go off the college,” he said, adding that the next stop in what he called his “pilgrimage” was in Lakeland and the YMCA of West Central Florida, where he was executive director and his primary focal points were outreach — and golf. Calling the sport the “great equalizer,” Smith said he learned of the game’s many character-building qualities — while failing to master most of its nuances himself — at a tiny, nine-hole, par-3 course run by the Y. He was also heavily involved in the First Tee of Lakeland, the local chapter of a national program designed to introduce young people to the sport. “I was able to bring together kids from both affluent communities and economically challenged areas on the same golf course, where they’d face the same challenges,” he said. “There would be foursomes with two foster kids and two kids living in $500,000 homes. We used the game of golf to do that; it teaches life skills, and it teaches people how to get along and really understand people from different cultures. From Lakeland, Smith ventured further east to Orlando and the massive YMCA of Central Florida (actually a group of many smaller Ys), which he served first as district executive director and then district/group vice president of operations. In those capacities, he honed his Y-management skills, while also doing more work with young people and bringing together people from different economic situations. He considers perhaps his greatest accomplishment there to be efforts to raise more than $1.75 million to expand the Y in Kissimmee during the height of the Great Recession, which hit Central Florida as hard as, if not harder than, than any area in the country. As he talked about his career progression, Smith noted that the YMCA is an organization in which people like him are presented with ample opportunities for advancement, however one chooses to define that term. The key, he continued, is to perform the requisite due diligence and find the opportunity that makes the most sense. He believes he did so with the Springfield position, and that his interviews, research, and talks with people like his predecessor, James O’S Morton, convinced him that this was the right move at the right time. By that, he meant he often needs a push, or maybe a few, to get on the treadmill, in the pool, or to the place he’s most comfortable — the basketball court. “When I look at all these NBA players, I feel like I should be one of them, so I live vicariously through them in a way,” he said. “I’ve been playing a long time; when I was in the military, I played a lot in South Korea in various leagues. I’m a shooter — to borrow a military term, I’ve always been a sniper. For starters, he plans on spending most hours on that assimilation process he described. This will be a multi-pronged effort that will include everything from working the front desk and the floor of the workout area — “I’m going to put on my khakis and do some shifts” — to meeting face-to-face with members of his board, the Y, the business community, and other constituencies. Which brings him back to that engagement task force he’s putting together. Meanwhile, he’ll be conducting that broad balancing act facing all Y directors, the one involving service to the community as a whole and service to members. Both require a firm commitment, and neither can be overshadowed by the other, he told BusinessWest, adding that both are part of the mission. And a big factor in attaining that commitment and involvement is communication — getting the message out about how the Y leverages contributions from donors and even membership fees to operate programs ranging from day-care and after-school initiatives to summer camps and youth basketball leagues. “We want to communicate that message as often and effectively as we can to all our members, our community stakeholders, and all our constituencies,” he said. “We want everyone to know what the Y does with those dollars because we’re very committed to being good stewards and leveraging the support we’re getting from our donors and anyone in the community. As he talked with BusinessWest, Smith was interrupted briefly by a phone call that somehow found its way to his office. He politely informed the person on the other end that he would transfer him to someone who could help, and then struggled to find the right buttons to do so. “That’s another thing I have to learn,” he said with a trace of frustration, noting quickly that, only a few days into his job, there were too many items on that list to count. But even at this early juncture, Smith is quite confident that he and the Y he considers a perfect match, development-wise, are ready to take some big steps forward. To do that, he’ll summon lessons from South Korea, Tampa, Orlando, and, yes, the River City Correctional Facility, and create some of that momentum for himself and the Y.